Welcome to Washita Retriever's web site. 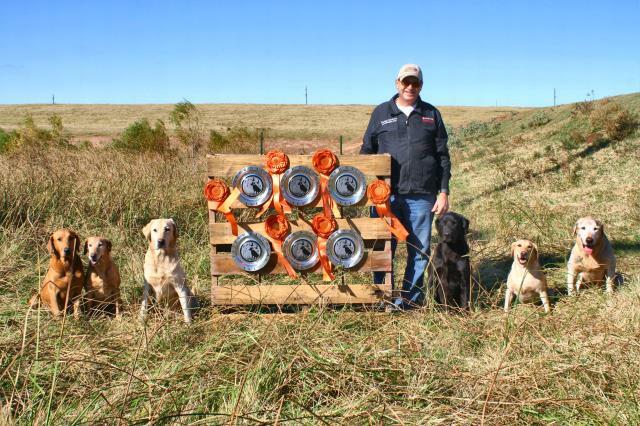 We are a full service kennel near Rush Springs, Oklahoma specializing in Retriever field training, but also offering Labrador puppies, Titled Labrador stud service, Trained retrievers for sale, Boarding, Any breed obedience training, and Custom whelping services. We understand that your dog is as much a part of your family as our dogs are ours. In the hustle of everyday life, you can be sure that we will not forget that fact, and that whether being field trained, obedience trained, boarded, or bred, we will treat your family member right. We are in the process of updating our Trained Retrievers For Sale page (4-25-2017) so check back soon! We will have several new started as well as seasoned dogs available! In the mean time, give me a call and see what we have coming up. Click Here to go directly to link. Lots of pictures, videos, and pedigrees! Also, congratulations to HRCH Sir William Chocat Grizzley SH for making it to the third series! Further Congratulations are in order to GRHRCH WR Washita's Big Jake MH and GMHR HRCH Oz's Yellow Fever of Washita MH for passing a tough Fall 2006 International Grand! Also, congratulations to HRCH Hail's Washita 2 Dot Girl for making it to the 4th series, HRCH Drake's Banded Lacy for making it to the 3rd, and HRCH Doc's Ciara Mist of Washita SH for making it to the 2nd series. Washita Retrievers is devoted to producing the highest quality field bred Labrador pups available. We use only breeding stock that has been certified by OFA and CERF to ensure as much as possible that our pups are free from genetic defects. In addition, each Washita pup comes with a written guarantee against genetic defects. All of our pups are sired by (FC, AFC, GMHR, MHR, MH, HRCH) titled dogs, and many of our dams are titled (GMHR, MHR, MH, HRCH) as well. Our Training Program is built on a "firm but fair" approach which consists of spending more time showing and teaching an individual dog in the way most suitable for that particular dog's understanding, attitude, and ability as compared to relying completely upon force to obtain a desired response. 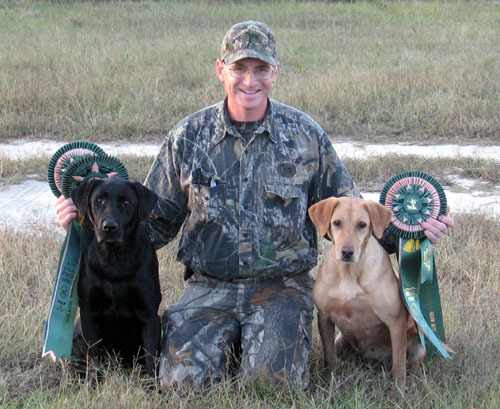 While more time is spent adapting the training to the special needs of each particular dog, we feel the extra effort is well worth it since the finished hunting retriever has a much better attitude about performing his job at the elevated standards for which he has been bred and trained. In addition, we limit the number of client dogs in for training at one time in order to provide for each dog's individual needs. 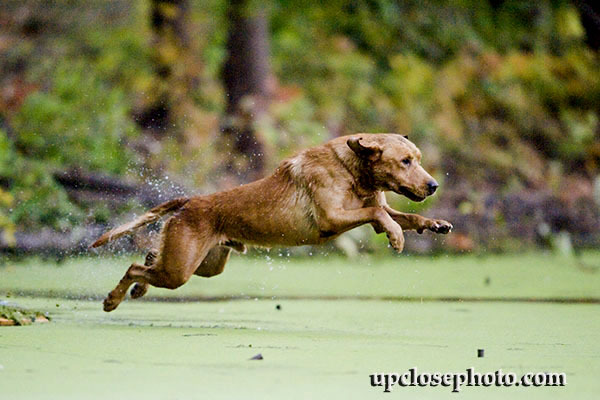 We provide hunting and hunt test retriever field training and handling as well as any-breed obedience training. For more information including fees and scheduling, please contact Washita Retrievers.